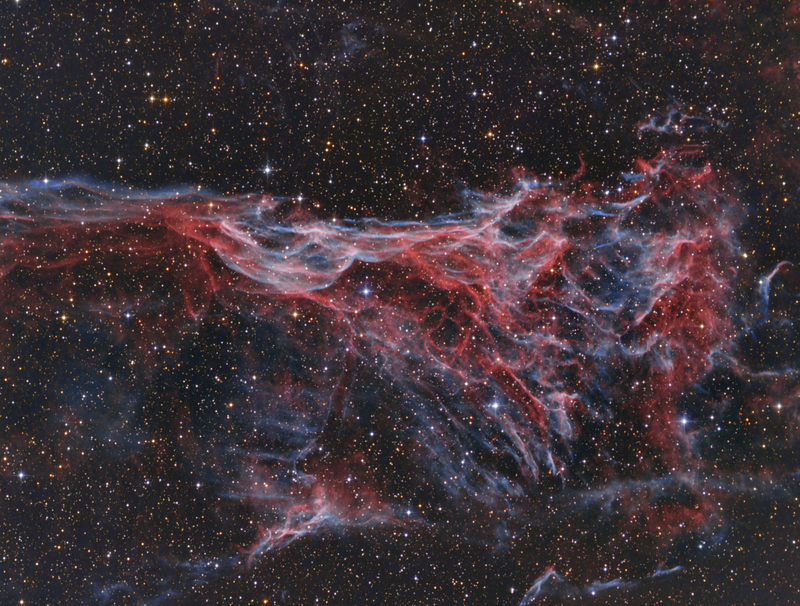 The chaotic arranged filaments of glowing gas depicted here are part of the Veil nebula in the constellation of Cygnus. The Veil nebula is a remnant of a giant star explosion, visible as an expanding cloud that has been created during the explosion of a mass rich star. It is estimated that the light of this explosion has reached the Earth 5000 years ago which means, that the nebula lies in a distance of about 1500 light-years. In the meantime the whole nebula extends to about 70 light-years in diameter. The picture shown here displays about one third of it. Interstellar matter is moved by the gravitation waves caused by the explosion and thus stimulated to glow.